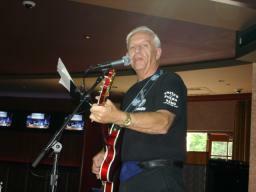 Tom is pictured here as he sings and yodels the tune, Chime Bells, during FPB's 2nd set at Vapor at Saratoga Gaming & Raceway on August 12, 2007. 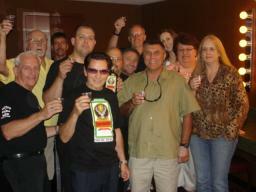 Look at all the smiles on this happy bunch, as they toast some Jager punch! 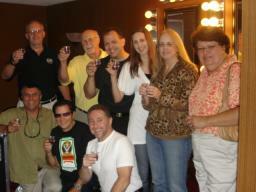 (Photo taken on August 12, 2007 at Vapor at Saratoga Gaming & Raceway) FPB and their friends toast some Jager punch on August 12th at Vapor at Saratoga Gaming & Raceway. 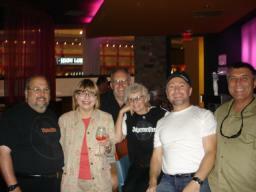 George, Tom, and Fritz present a Jager shirt to their friend, Kathy in Saratoga Springs, NY on August 12th. Patti (who came all the way from Utah) is pictured here on August 12, 2007 during FPB's gig at Vapor at Saratoga Gaming & Raceway. Gabe and his wife, Nancy, are pictured here during intermission at FPB's gig at Vapor at Saratoga Gaming & Raceway, long with some of their good friends. 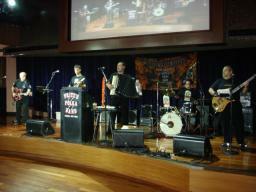 A shot of FPB cranking out a tune, underneath the big video screen, at Vapor at Saratoga Gaming & Raceway in Saratoga Springs, NY on August 12th. 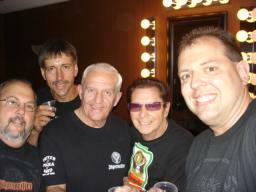 The guys in FPB toast some special Jager punch in their dressing room before their first set on August 12, 2007 in Saratoga Springs, NY. 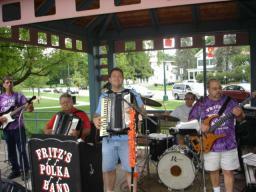 The guys in FPB crank out a tune during their gig at the Village Green in Hamilton, NY on August 9, 2007. 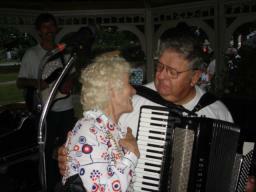 As Frank looks on from in back, Fred is given a hug by Ann, during FPB's gig at Folts Homes in Herkimer, NY on August 7, 2007. FPB played Happy Birthday to Ann, and she showed her appreciation in a festive way! While during a break at the Swiss Picnic in Boonville, NY on August 5, 2007, Mr. Thunder helps Elaine Pavlick model the Jagermeister "wrist" band, as The Lightning Bolt helps steady her. Isn't that nice of them? Fritz, Frank, and George toast some Jagermeister punch with their friend, Elaine, while at the Swiss Picnic at Stysh's Brown Barn Campground on August 5th. Fred and Fritz are shown here with FPB Fan Club Member, Bob Zeller, just prior to Bob yodeling a tune with FPB at the Swiss Picnic in Boonville, NY on August 5th. 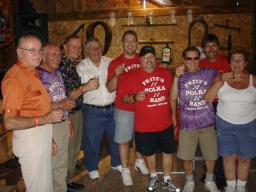 The guys in FPB toast some Jagermeister punch with their friends, Frank Lekki, Ron Williams, Frank Svet and Laura Wells on August 5th at the Swiss Picnic in Boonville, NY. 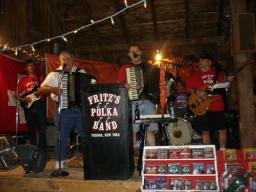 An action shot of Jagermeister-sponsored, Fritz's Polka Band at the Swiss Picnic in Boonville, NY at Stysh's Brown Barn Campground on August 5, 2007.